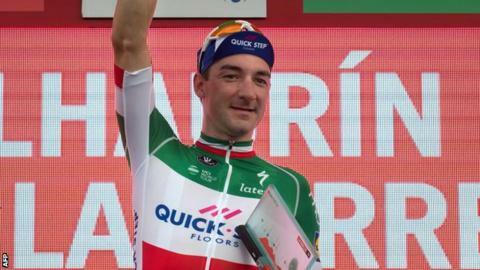 Italy's Elia Viviani edged out fellow sprinter Peter Sagan in a close finish to win stage 10 of the Vuelta a Espana. The pair battled it out over the final 500m of Tuesday's 177km flat stage from Salamanca to Fermoselle. But it was the Quick-Step rider who always looked the stronger as the stage reached its climax as he added to his stage three win last week. Britain's Simon Yates retains the leader's red jersey after finishing in the peloton. He maintains a one-second lead over Spain's Alejandro Valverde, while Valverde's Movistar team leader Nairo Quintana remains third, 14 seconds back. Viviani, who claimed his 17th victory of the season, was quick to praise the efforts of his team-mates. "That was just about the best lead-out from our team this year," said the 29-year-old. "The guys did a great job, there's a great deal of pressure to deliver and win when people see you as the fastest. "You really don't want to lose,"
It was a third runner-up finish for Sagan but the Slovakian still leads the sprinters' points classification. Wednesday's 207.8km 11th stage from Mombuey to Ribeira in Galicia will feature four medium climbs.